The drive to Partow Hooshmandrad's apartment in Oakland was only ten minutes. But it seemed much longer. I was trying to come up with some questions to ask her but my lack of knowledge about traditional Iranian music was making it very hard. Plus, I had to pay extra attention to my driving as another El Nino rain was hitting the Bay Area. I turned into her street and parked in an illegal spot in front of the large, gray, almost baroque apartment building. I ran to the entrance. As usual, I didn't have an umbrella with me. But nevermind that. I was meeting an accomplished musician and I had nothing to ask. Hooshmandrad's apartment is a medium-size studio with a couple of klims on the dark hardwood floor. With the bed, piano, TV, couch, two desks, bookshelf, and music racks housing hundreds of tapes, there's very little empty space. She offers some tea, which I immediately accept. I ask why did she get interested in traditonal music? Did any members of her family play musical instruments? "My grandfather used to play the tar, but only for his friends," she said. "He was the head of the Supreme Court. My family lived in the Takht-e Jamshid/Bahar neighborhood of Tehran. I started playing the piano when I was five. My main teacher was Farman Behboud. So I became familiar with Western music at an early age but it was much later when I got to know classical Iranian music. In our house the radio was often on but I wouldn't listen to traditional music. But I had heard about dastgaah." "Iranian music has 12 musical divisions or dastagaah," she explains. "Some categorize it into seven dastagaahs and five aavaaz. In any case, shoor is one of these divisions, which I really like. Around 12 years ago I decided to seriously study traditional music. Every day for six months, I studied and I listened to shoor until it bit me! I simply fell in love with it. I cannot tell you what it does to you. It's like a very complicated spirit; the gaps between the notes, the way it stops, the way it carries on again, the way it..."
She sings a few notes with a full, beautiful voice. 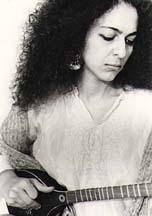 Hooshmandrad spends much of her time studying toward a PhD in ethnomusicology, with an emphasis on traditional Iranian music, at the University of California, Berkeley. She rarely performs. "I still consider myself a student. I have many more years to go," she insists. 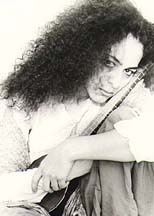 Partow studied Persian music with such great masters as the late Mehdi Kamalian, M.R. Lotfi, Keykhosrow Pournazeri, and for shorter periods with Mahmoud Zoufonoun, Hossein Alizadeh, and Behrouz Hemmati. Also she took lessons for short periods with Mahmoud Zoufonoun, Hemmati, and Alizadeh . The zarb, or tombak, she learned from Dariush Zargari. She herself may not boast about her sehtar skills, but audiences in the Bay Area have raved, especially after her recent performance at a fund-raising event for the San Francisco Symphony in San Rafael. I'm curious. Will she become a full-time performer one day? "I'm not sure. I prefer to give a couple of good concerts a year, rather than numerous mediocre ones. If I start thinking about how many concerts I need to do a year to be able to pay my rent, then I'll be in trouble. It would kill my spirit." I wonder why there has been such great interest in traditional music in recent years. Is it because Pop music has been banned in Iran and there's no alternative? "This sounds like a cliche, but the growing interest is because people want to return to their roots. It's not just because you can't listen to Pop music. It's not that simple because people still have access to Pop music. The reason might be that people see a kind of truth in traditional music. And it's become fashionable as well! There's a growing awareness about what might be called 'artistic music'." I ask about her observations during her recent trip to Iran. "Interest in music has become widespread. There are so many teachers and performers and recordings. There are special schools. You see 10-12 year olds playing the sehtar. But at the same time, quality has suffered. There are a lot of charlatans posing as music teachers. They are not as meticulous as they should be." "There have always been women musicians. But in the past there weren't many because they were expected to be wives and mothers. And there were cultural obstacles to women performing in public. But these days there are many women learning and performing music. One of the interesting things I saw was a woman in full chador coming to a coed music school to learn the ney -- which is not considered a feminine instrument." What should be done for people to really understand and appreciate traditional music? "Iranian radio and TV stations in Iran must raise the standard of what they broadcast. And the government should give financial support to musical activities." "I just want to add something," she says. "We need a certain measure of democracy among musicians. We haven't learned how to work as a group. The musicians' tolerance level is low. Also, we have to regain our focus as performers. A musician should have a certain strong, focused presence during a performance. A musician must bring out his or her inner spirit and let the audience feel it. Also a performer should have the courage to create silent moments during a performance. These pauses allows the music to settle into the hearts and minds of the audience." "To me, the most important thing in life is love and tenderness," she says. "I want to express mehr (kindness) through music." Before I leave, Hooshmandrad points out that the public don't respect musicians as much as they pretend to. And Iranian parents want their children to grow up to be doctors rather than artists. Girls face even more obstacles. She pulls out a wrinkled envelope from a file in her bookshelf and took out a photograph. "My grandmother gave me this picture when I was a child," she says. " She never said why. Maybe it was my destiny."